What Is Teri Hatcher Doing in the Very British Cast of The Great Stand Up to Cancer Bakeoff? The answer to the question posed by this headline is likely “money,” followed by “a sense of goodwill” and love of baked goods, but I’m still not one hundred percent satisfied. Teri Hatcher, what are you doing? Deadline reports that Hatcher will join a host of British celebrities for a charity version of the beloved show; it will air for five episodes and is meant to “raise funds and awareness” for the charity Stand Up to Cancer. Here are the people that will be joining Hatcher in her journey to become Britain’s greatest American celebrity baker. Other stars appearing in the show include musical comedian Tim Minchin, presenter Stacey Solomon, Leader of the Scottish Conservative Party Ruth Davidson, comedian, writer and actress Roisin Conaty, Kaiser Chiefs’ frontman Ricky Wilson, Diversity’s Perri Kiely, TV presenter Nick Hewer, broadcaster Melanie Sykes, comedian Lee Mack, Paralympic gold medallist Kadeena Cox, comedian Joe Lycett, Made in Chelsea’s Jamie Laing, comedian Harry Hill, pop star Ella Eyre, journalist and presenter Bill Turnbull, comedian Alan Carr and comedian and actor Aisling Bea. All of these people...and Teri Hatcher! The leader of the Scottish Conservative Party and Teri Hatcher! A British paralympic gold medalist and Teri Hatcher! It boggles the mind! I have no issue with Teri Hatcher, star of Desperate Housewives, appearing in a celebrity version of this baking program, but I’m just more curious about the why. Her presence notwithstanding, I will still find a way to watch this, because if there’s anything I love more than celebrities participating in competition-based reality shows, it’s celebrities participating in competition-based reality shows that feature the culinary arts. 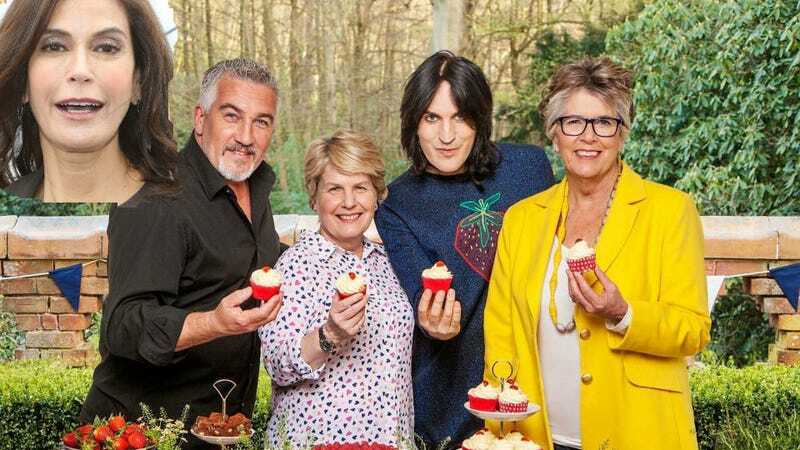 A word of caution: Even though it’s fun to watch celebrities bake things in a tent in the English countryside, remember that this is the cursed version, absent Mary Berry, Sue Perkins, and Mel Giedroyc. Of what you once knew and loved, only Paul Hollywood, of the flinty blue eyes and the crispy hair, remains.